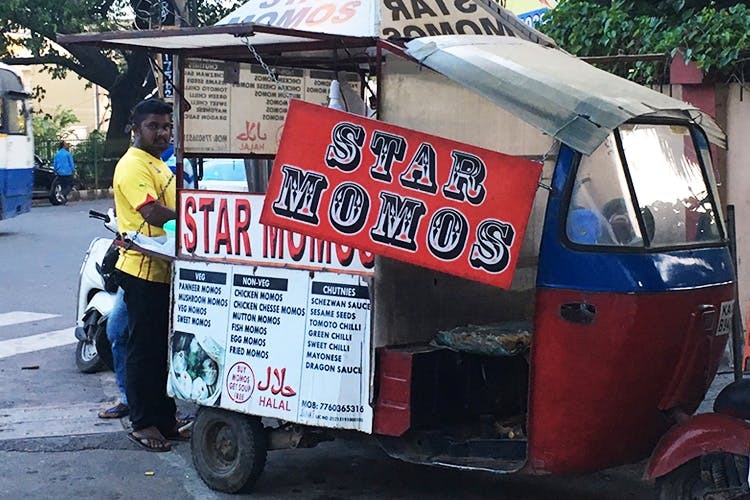 Star Momos is an auto rickshaw/ momo station that serves up quite the list of momos with a complimentary bowl of soup to go along with them. Oh! And they home deliver in the area! We caught this cutie on the streets of Richard’s Town selling quite the selection of momos. Having been around for over two years, Star Momos has earned quite the reputation with interesting options like fish momos, chicken cheese momos and mutton momos on the menu. Vegetarians rejoice, as this red and blue three-wheeler offers plenty of vegetarian options we well with paneer momos, mushroom momos and sweet momos on their list. Taking thing up a notch with its extensive choice of chutneys to pair these steamed goodies with, this momo joint is keeping things fresh by giving you seven sauces to choose from and the list includes sesame seed chutney and dragon sauce. And with every plate of momos you buy, you get a a serving of veg or chicken soup completely free. A plate of veg momos will cost you INR 50 and the non-veg momos start at INR 60 a plate. You can find this momo mobile any time after 4 pm right near Clarence High School and he should be around till about 10 pm, so you can squeeze in a late night snacking session. And the best thing about this momo rickshaw is that it does home deliveries within a 2 km radius. Give them a call on +91 7760365316.